Each poster comes with a signed letter from Ace Gallery attesting to it's provenance. Supplies are limited: Only 3 left in inventory. 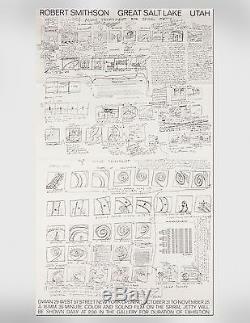 Spiral Jetty Movie Treatment was printed to advertise daily screenings of Robert Smithsons film, Spiral Jetty, which he co-directed with his wife, artist Nancy Holt. Construction of Spiral Jetty began in April of 1970, as did the filming of the earthworks documentary portrait, co-funded by Ace Gallery and Dwan Gallery. In the winter of 1970, Spiral Jetty was debuted at Ace Gallery Los Angeles, Ace Gallery Vancouver, and Dwan Gallery New York. This small inventory of Spiral Jetty Movie Treatment posters was acquired by Ace Gallery from Dwan Gallery and has been held in our archives since 1970. 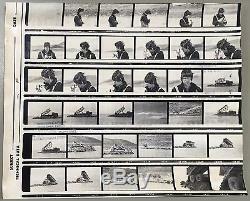 Pictured above: Photos taken of Robert Smithson during Spiral Jetty's Construction. [Photographs and image rights are property of Ace Gallery exclusively and are NOT for sale or unauthorized redistribution]. 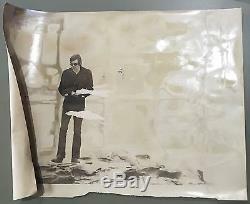 The item "Robert Smithson, Spiral Jetty Movie Treatment, 1970, Exhibition Poster Dwan" is in sale since Tuesday, March 07, 2017. This item is in the category "Art\Art Posters". The seller is "acegallerlosangele-0" and is located in Los Angeles, California. This item can be shipped to United States.